Improving the oral health of children in Orange County is our number one goal! We could not accomplish this goal if we didn’t employ a staff of the best professionals! In keeping with our high quality and performance standards, we hire the best of the best. 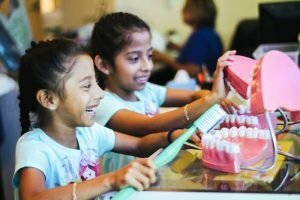 When you work with Healthy Smiles For Kids, the work you do directly affects the health of thousands of children throughout the county and beyond. Knowing that the work you do has an impact in the community is not only empowering but also gives you a cause you can stand behind while witnessing the impact of your contributions. At Healthy Smiles For Kids, our employees make all the difference. View our open positions here and see how you can make an impact! Healthy Smiles provides equal employment opportunities (EEO) to all employees and applicants for employment without regard to race, color, religion, gender, sexual orientation, gender identity or expression, national origin, age, disability, genetic information, marital status, amnesty, or status as a covered veteran in accordance with applicable federal, state, and local laws.